BERLIN — Chancellor Angela Merkel's conservatives beat their rivals on Sunday to win her a fourth term in an election that will brought a far-right party into Germany's parliament for the first time in more than half a century. After shock election results last year, from Britain's vote to leave the European Union to the election of President Donald Trump, many look to Merkel to rally a bruised liberal Western order, tasking her with leading a post-Brexit Europe. Stressing that "we live in stormy times" internationally, Merkel declared: "I have the intention of achieving a stable government in Germany." Merkel's center-left challenger, Martin Schulz, conceded that his Social Democrats had suffered a "crushing election defeat," with projections showing the party's worst performance in post-World War II Germany. Sunday's election left Merkel's bloc weakened — with only 246 of the new parliament's 709 seats. However, the result leaves no other party able to lead a new government, and Merkel herself lacks any obvious internal challenger. Her conservative bloc won 32.9 percent of the vote, down 8.6 points from the 2013 election and hitting its lowest level since 1949. Merkel now faces lengthy talks to secure an alliance with parties that have a tradition of mutual suspicion as well as differences on issues including migration, European financial policy and the auto industry's future. One of the biggest shocks was the strength of the Alternative for Germany (AfD) which won 13 percent of the vote. It was the first time a far-right party entered the German parliament in more than half a century. Perspective is important: 13% for rightist populist in Germany is bad, but well below what we see in a number of other European countries. Some business leaders were alarmed, saying a party likened by the foreign minister to Nazis could hurt Germany. One of the AfD's leading candidates, Alexander Gauland, gave a taste of what is to come, vowing to "hound" Merkel and "get our country and our people back." Founded in 2013 by an anti-euro group of academics, the AfD has morphed into an anti-immigration party that has profited from Merkel's 2015 decision to leave German borders open to over 1 million migrants, most of them fleeing war in the Middle East. The other parties elected to the Bundestag all refuse to work with the AfD, which says it will press for Merkel to be "severely punished" for opening the door to refugees and migrants. Outside AfD's election party in Berlin after the results were announced, at least 500 protesters shouted "all Berlin hates the AfD," ''Nazi pigs," and other slogans, while several protesters threw bottles as police kept them away from the building. Similar protests broke out in Cologne, Hamburg and Frankfurt but police said they were mostly peaceful. Major Jewish groups expressed dismay at the AfD's showing, with the World Jewish Congress calling the party "a disgraceful reactionary movement which recalls the worst of Germany's past." Fellow European right-wing populists hailed AfD's performance. The Netherlands' Geert Wilders wrote on Twitter: "The message is clear. We are no Islamic nations." "Bravo to our allies from AfD for this historic score!" tweeted Marine Le Pen, the runner-up in France's presidential election. "It's a new symbol of the awakening of the peoples of Europe." Merkel, 63, is Europe's longest-serving leader. 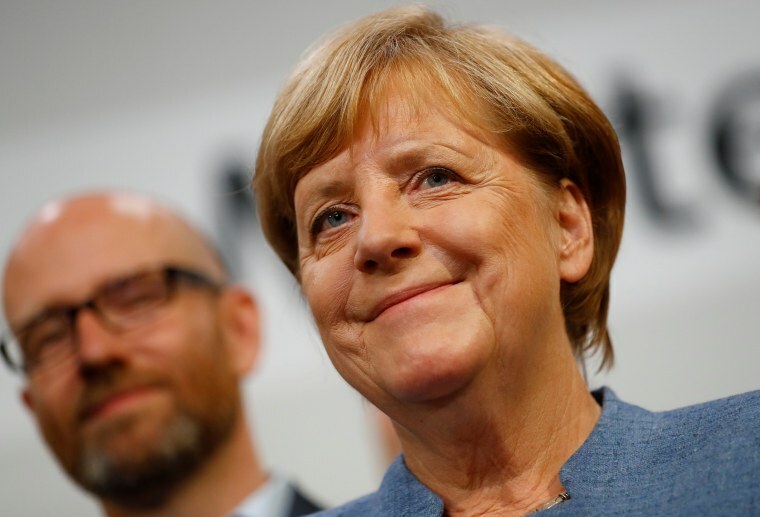 She joins the late Helmut Kohl, her mentor who reunified Germany, and Konrad Adenauer, who led Germany's rebirth after World War II, as the only post-war chancellors to win four national elections.